Oxygen declines have been seen to affect Atlantic wolffish, and also threaten Atlantic cod, snow crabs, and Greenland halibut that all live in the depths. Temperatures have soared so high in Norway’s Arctic region this summer that reindeer are taking shelter from the heat in traffic tunnels and in other shaded places. 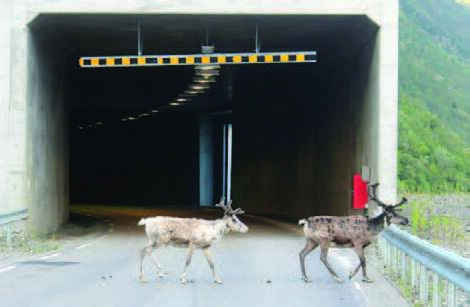 The Norwegian Public Roads Administration took the unusual measure of urging motorists to be on the lookout for the tundra grazers after at least 44 traffic collisions with reindeer and sheep occurred during July. Only 13 percent of the world’s oceans remain untouched by such human influences as shipping, pollution and fishing, according to an international team of researchers. Writing in the journal Current Biology, they determined that the areas remaining “mostly free of human disturbance” are now almost entirely in the Arctic and Antarctic, and around some isolated Pacific islands. Sea creatures are literally being eaten away and ‘dissolved’ by pollution, scientists have discovered. It’s feared that high levels of carbon dioxide in the water could cause irreparable damage to marine ecosystems after tests found acute levels of the gas cause starfish to dissolve. A team of marine scientists conducted a four-day experiment at Loch Sween on Scotland’s west coast to measure the response to short-term carbon dioxide exposure. When high levels of carbon dioxide enters the oceans it causes them to become more acidic. A heatwave that struck a quarter of the world’s oceans in 2016 was made far more likely by climate change, according to a new study. Nicknamed “the blob” when it appeared in the eastern Pacific, the mass of warm water was linked with the deaths of marine animals and the devastation of ecosystems. Ocean water naturally goes through phases of higher temperatures – notably the event known as El Niño, which leads to periods of warmer water in the Pacific Ocean. Climate change is also thought to contribute to some of this temperature fluctuation, but it can be difficult establishing the exact contribution it makes. However, a team of Australian scientists has concluded the heatwave of 2016 was influenced by anthropogenic – that is, human-induced – climate change. The research focuses on warming around northern Australia, which resulted in mass coral bleaching, and the northern Pacific Ocean between Alaska and Russia. Extreme temperatures in the Gulf of Alaska have been linked with the deaths of thousands of seabirds and whales during this period. The noise pollution produced by ships and marine construction projects in the Gulf of Maine is drowning out the sounds that Atlantic cod and haddock need to communicate with each other, according to a new study. The U.S. environment agency NOAA says this is altering the behavior, feeding, mating and socializing of the commercially important fish. The study concludes that since the fish make sounds to attract mates and listen for predators, not hearing those signals could threaten their breeding success and survival. A global conference to better protect marine life has raised more than $7bn and won commitments to protect huge swathes of the Earth’s oceans. The European Union, which organised the ‘Our Ocean’ conference in the Maltese capital of Valletta, its 28 member states and its EIB investment bank gave almost half those financial commitments, about $3.4bn. 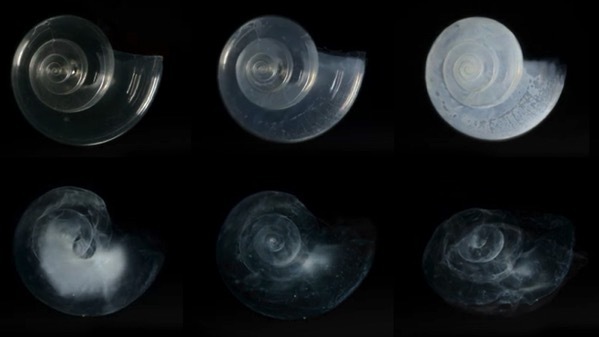 A sea snail shell is dissolved over the course of 45 days in seawater adjusted to an ocean chemistry projected for the year 2100. The uninhabited Henderson Island has gained a lot of attention because of the fact that it has no people, but lots of trash. A recent study determined that the island has become a dumping ground for plastic refuse. Unfortunately, it’s not alone. Here are just a few examples of seemingly pristine locales that have become polluted by humanity’s waste. The Mariana Trench: The Mariana Trench is the deepest part of the ocean and, as such, one would expect it to be free from humanity’s touch, but that is not the case. A study has discovered that sea life living in the trench were found to have high levels of cancer-causing pollutants in their bodies. Ironically, the isolated nature of the Mariana Trench is part of the reason that these pollutants often end up there. We know less about the depths of the ocean than we do the surface of the moon, but this serves as a reminder that our actions have consequences regardless of whether we are aware of them. “The fact that we found such extraordinary levels of these pollutants in one of the most remote and inaccessible habitats on Earth really brings home the long-term, devastating impact that mankind is having on the planet,” said co-author Alan Jamieson. Hawaii’s Northwestern Islands: Hawaii is a tropical paradise and one of the world’s top vacation spots, but it also has a string of uninhabited islands. Those islands serve as a wildlife refuge for many types of marine life, but, like Henderson Island, they too have became littered with trash. The problem has gotten so bad that the U.S. National Oceanic and Atmospheric Administration has organized cleanup efforts. A recent expedition uncovered more than 57 tons of garbage. In addition to polluting the water and ruining the area’s natural beauty, the trash, which is mostly plastic, is dangerous to the local wildlife. The debris, which includes lighters, bottle caps, and other hard plastic items, are often mistaken for food by seabirds, which will feed the trash to their offspring. Smaller debris isn’t the only problem facing these islands. Despite the fact that fishing is prohibited in wildlife sanctuaries, lost nets and lines that often end up in the area can kill larger marine life such as dolphins or sea turtles. Plastic Is The Problem: In the case of both Henderson and Hawaii, the bulk of the discarded trash is made of plastic. Every year, roughly 8 million tons of plastic waste ends up the in ocean. This waste is then caught up in gyres that carry the garbage to remote locations. Evidence continues to mount that climate change has pushed the Arctic into a new state. Skyrocketing temperatures are altering the essence of the region, melting ice on land and sea, driving more intense wildfires, altering ocean circulation and dissolving permafrost. A new report chronicles all these changes and warns that even if the world manages to keep global warming below the targeted 2°C threshold, some of the shifts could be permanent. Among the most harrowing are the disappearance of sea ice by the 2030s and more land ice melt than previously thought, pushing seas to more extreme heights. The findings, released Monday in the Snow, Water, Ice and Permafrost in the Arctic (SWIPA) assessment, come after a winter of extreme discontent for the region. Sea ice receded a bit in November, a rare occurrence, and hit a record-low maximum for the third year in a row. Temperatures averaged 11°F above normal, driven by sustained mild weather that was punctured by periods of almost unheard of heat when temperatures reached up to 50°F above normal. The decline of sea ice is well documented. It’s disappearing in all seasons with the fastest shrinkage in the summer months. Old ice, which has formed the bedrock of sea ice for decades, is also declining precipitously. That leaves new ice in its place and susceptible to melt. The new analysis shows that the average number of days with sea ice cover has dropped by 10-20 days per decade since 1979. Some areas, such as the Barents and Karas seas, have seen even steeper declines. Disappearing sea ice means the darker ocean left in its wake absorbs more energy from the sun, speeding the warming in the region. Arctic soil holds up to 50 percent of the world’s soil carbon. Rising temperatures are melting permafrost, causing it to release some of the carbon into the atmosphere. While the carbon release so far has been relatively small, rising temperatures have the potential to rapidly reshape the landscape and speed the melt. The biggest impact for the globe is the melt of land ice from Greenland’s massive ice sheet. It’s the biggest land ice driver of sea level rise, and it’s been melting at a quickening rate since 2011. If carbon emissions continue on their current trends, the report indicates 29 inches would be the low end of sea level rise estimates by 2100, roughly 9 inches higher than the minimum IPCC estimate. And that’s just the low end, with more sea level rise possible as scientists untangle the web of melting in Greenland as well as the Antarctic. The massive rush of freshwater into the Arctic Ocean is also reshaping ocean circulation and the ecology of the region. Researchers have seen a marked slowdown in North Atlantic circulation as cold, fresh water off Greenland’s southern tip has acted as a roadblock to the currents that steer water through the region. That has the potential to mess with ocean circulation as well as weather patterns, particularly in Europe. Climate change is predicted to cause a series of maladies for world oceans including heating up, acidification, and the loss of oxygen. 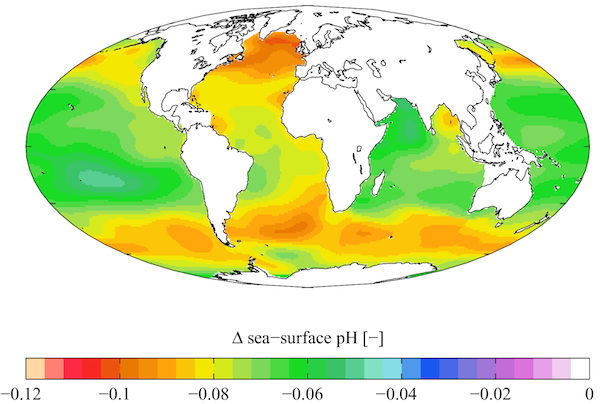 A newly published study published online in the April 24 edition of the Proceedings of the National Academy of Sciences titled “Ocean warming since 1982 has expanded the niche of toxic algal blooms in the North Atlantic and North Pacific Oceans,” demonstrates that one ocean consequence of climate change that has already occurred is the spread and intensification of toxic algae. Toxic or harmful algal blooms are not a new phenomenon, although many people may know them by other names such as red tides. These events can sicken or kill people who consume toxin-contaminated shellfish and can damage marine ecosystems by killing fish and other marine life. The distribution, frequency and intensity of these events have increased across the globe and this study links this expansion to ocean warming in some regions of the North Atlantic and North Pacific Oceans. Marine algae are so tiny—50 of them side by side span only the width of a single hair—that they may seem harmless. But when billions of toxic cells come together, they can poison humans, kill marine life, and economically harm coastal communities. The waters of the Arctic Ocean are becoming increasingly similar to those of the Atlantic as warm currents from the south flow in, according to a new report. It says the intrusion of the warmer Atlantic currents is also contributing to the accelerated melting of sea ice. The increased Atlantic currents have removed a thick layer of cold surface waters that had previously insulated the polar ice cap, allowing it to thin. “Rapid changes in the eastern Arctic Ocean, which allow more heat from the ocean interior to reach the bottom of sea ice, are making it more sensitive to climate changes,” said oceanographer Igor Polyakov. Environmentalists say that changes to a Polish law have led to a “massacre” of trees across the country. New legislation that went into effect on Jan. 1 removed previous requirements that private landowners who want to cut down trees must apply for permission, pay compensation, plant new trees or even notify authorities about the removal of trees. “We used to receive around one telephone call a day from people concerned about trees being cut down in their area. But suddenly, we had two telephones ringing all day long,” said Pawel Szypulski of Greenpeace. Freshly cleared spaces are now being reported around Polish cities and across the countryside. The six ocean hot spots that teem with the biggest mix of species are also getting hit hardest by global warming and industrial fishing, a new study finds. An international team looked at more than 2,100 species of fish, seabirds, marine mammals and even tiny plankton to calculate Earth’s hot spots of marine biodiversity. These underwater super-zoos are in patches of ocean that are overfished and warming fast, and these pressures hurt the lush life there, according to a study appearing in Wednesday’s journal Science Advances. While scientists in the past have identified key areas of biodiversity, the new work is more detailed. Researchers found the liveliest ocean hot spot also happens to be where the science of evolution sprouted: the Pacific Ocean off the central South American coast. It includes the area around the Galapagos Islands. Other hot spots include the southwestern Atlantic Ocean off Argentina; the western Indian Ocean off the African coast; the central western Pacific Ocean surrounding Malaysia, Indonesia and the Philippines; the southwestern Pacific off Australia’s southern and eastern coast; and the Oceania region of the Pacific around the international date line. Four of the six hot spots are in the Pacific; all are either in the southern hemisphere or just north of the equator. A new survey of the Great Pacific Garbage Patch finds that the enormous floating mass of trash is far denser and larger than previously believed. In a series of low-altitude, low-speed aerial flights over the plastic accumulation zone between Hawaii and California, the Dutch-based Ocean Cleanup foundation found chunks of garbage, mostly plastics. Many of the debris items measured more than half a yard in diameter. The field also contains far smaller bits that were detected by experimental plastic- scanning equipment. The foundation plans to soon begin testing a V-shaped rubber boom designed to “herd” the floating debris into a recovery cone. 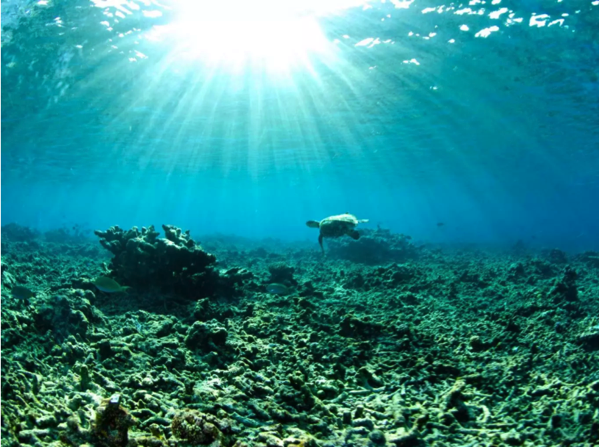 The world’s waters have absorbed more than 93 percent of the enhanced heating from climate change since the 1970s, curbing the heat felt on land but drastically altering the rhythm of life in the ocean, he said. The study includes evidence that ocean warming “is causing increased disease in plant and animal populations,” it said. Microplastic particles appear to be killing fish because their larvae prefer to eat them rather than their actual food, researchers have warned. With fears that the amount of plastic in the oceans could soon equal the weight of fish in the sea, scientists have become increasingly concerned about the effects on the marine environment. Now a study published in the journal Science has found that baby perch will actively choose to eat plastic over the plankton they would normally feed on. The researchers said this greatly increased mortality rates of the perch, stunting their growth and appearing to change usually innate behaviour. For example, they seemed to lose the ability to smell a predator that made them much more vulnerable. When placed in a tank with a pike, perch exposed to microplastic were eaten four times more quickly than perch that had not been eating plastic. All the plastic-fed fish had been killed within 48 hours. Microplastic is produced as larger pieces of plastic waste are broken down in the environment, but vast amounts of microfibers from synthetic clothes – things such as fleeces are essentially made of plastic – are produced each time they are washed and are small enough to pass through sewerage treatment plants and get into the sea. Cosmetics companies are also continuing to put plastic microbeads into their products.